Our service technicians are highly qualified in providing prompt and top quality door spring services like repair, replacement, and installation. Are you in need of a professional garage door contractor? The exceptional services of garage door repair will keep your garage system stable and functional. Our technicians are knowledgeable and experienced and provide repairs and thorough maintenance services in California. Do you want durable garage door parts and stable systems? 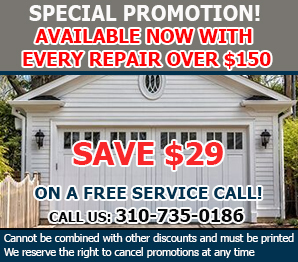 Trust our company for all garage door services! Our well-trained experts do a great job! We at Garage Door Repair Gardena are not in the business of telling customers what to do, but we certainly can advise them. With all of the talented service technicians working with us, you can trust their advice. If you have a problem with your garage door opener, they are skilled at working with every make and model. This makes it possible for them to advise you of what the problem might be with your particular type of opener. When you have trouble closing your garage door, this could be a result of your spring. Since the spring is such a vital part of your door, it is important that you know how a worn spring can affect the door's functionality. Our experienced and well-trained technicians have the know-how to provide you with advice about replacing or repairing your springs. Regardless of the type of garage door services you need in California, you can be sure that our technicians will be able to deliver. They are careful and make sure our customers are made aware of all of the problems they may be experiencing, even if it is not related to the initial problem we have been called to handle. We believe in handling the smaller issues before they turn into larger, more expensive repairs. When you need a garage door company in Gardena to install your door, our services are often recommended because of the value we offer. With our affordable prices, we’ll be able to give you a brand new door before the end of the week. However, if you have never had the pleasure of selecting your own residential garage door, you may have some serious thinking to do. Here are a few things you may want to consider when making your final decision about the type of door to have installed. If you need a practical door that offers great value we suggest that you consider purchasing a steel garage door. They are the most affordable and durable of all of the door types. There are some types of garage doors that will require more maintenance than the others. Make sure you are aware of this because it could affect your household budget. Make sure you know about all of the features of each type of automatic opener. This is what operates the doors of your garage and is one of the most important aspects to its operation. Residential doors are typically offered in wood, steel, fiberglass, aluminum and fiberglass. The best thing to do before you set out to buy a new garage door is research. Call and let our experts assist you in your researching possible doors for your home.